Bass players demand consistency, durability and versatility from their strings. Dunlop delivers. Dunlop Bass Strings offer traditionalists, slappers, and pick-wielding rockers cutting midrange, wide bottom end and a growl that will cut through any band. Carefully selected core to wrap ratios yield a low tension string with an extremely long life, and minimal break-in time. Each set is exceptionally well balanced string to string, and provides an amazing amount of dynamic range. 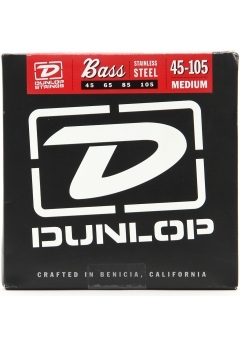 Dunlop Bass Strings are available in warm and rich sounding nickel-plated steel in all popular and custom gauges. Nickel Plated Steel, Warm and Harmonically Rich Tone, Smooth Tactile Feel, Long Lasting.